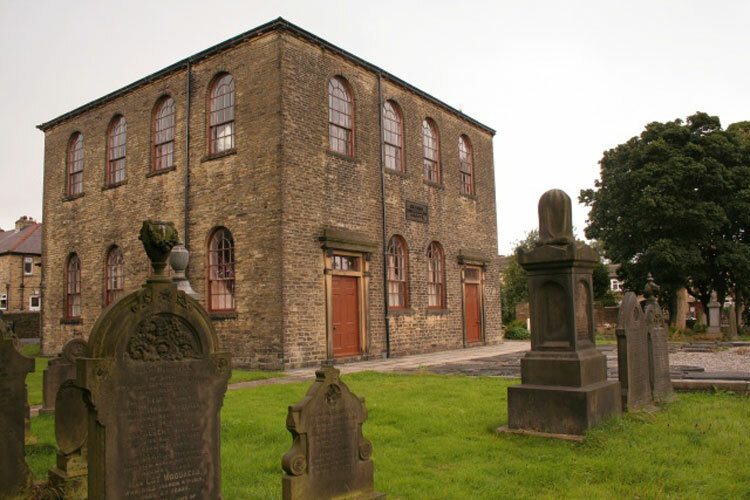 Shelf (Bethel) Methodist Chapelyard contains 4 burials from the First World War and 1 burial from the Second World War. There is also a Special Memorial to three Servicemen from the First World War who are buried in the Shelf Wesleyan Chapelyard. One Officer who served with the Yorkshire Regiment is commemorated on the Special Memorial. We are extremely grateful to Peter Lucas for providing the photograph of the Special Memorial. Select the above image for a larger image, which opens in a new window. 2nd Lieutenant Albert Edward Lord, MM. 12th Battalion Yorkshire Regiment. Son of Mr. and Mrs. David Lord; husband of Maggie Lord, of 1, Brow Lane, Shelf. Born at Halifax. Alternative Commemoration - buried in Shelf Wesleyan Chapelyard. Died of Wounds 29 April 1918. Aged 30. 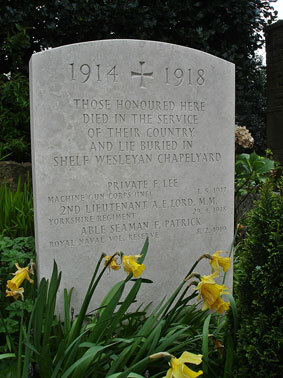 2nd Lieutenant Lord is also commemorated on the PLOEGSTEERT MEMORIAL. 2nd Lieutenant Lord was wounded in fighting by the River Lys on 11 April 1918. It must be assumed that he was transported back to England between that date and 29 April 1918, dying of his wounds in an English hospital. It seems rather curious that his name was included on the Ploegsteert Memorial, as he is recorded as "Died of Wounds" in the JUne 1918 issue of the Green Howards Gazette.